About 63 percent of the worldwide tuna catch is made by purse seine vessels. That’s why since its inception in 2009, ISSF has dedicated considerable effort to better understand and define what the main issues of concern are in purse seine tuna fisheries. ISSF conducts at-sea research to investigate potential mitigation measures; leads workshops with purse seine skippers to share mitigation techniques and seek input about other potential mitigation measures; and advocates for RFMOs to adopt mandatory data-collection and mitigation measures as well as needed management measures for tuna stocks. From observer coverage to unique vessel identifiers, this work has, in turn, informed a suite of conservation measures against which ISSF participating companies are audited annually and which impact how many purse seine vessels operate. It’s also led to the identification of further at-sea approaches for such vessels – from bycatch handling to species identification – aimed at improving the sustainability of global tuna fisheries. 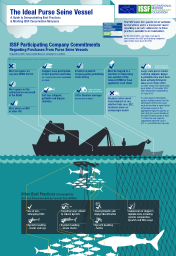 In an infographic and supporting paper, ISSF presents these participating company commitments – many of which are also tracked on ISSF’s ProActive Vessel Register – and other best practices encouraged by ISSF and some tuna RFMOs as a guide to tuna sustainability best practices for purse seine vessels.